Dan was appointed – without his consent or even his knowledge – as the Official Statistician & Tattoo Consultant for Not To Be Trusted With Knives (NTBTWK) on Pi Day, March 14, 2009 at 3:14:15.926 p.m. I sometimes email him with statistics-related questions for my own or even other people’s research projects (when I’ve been asked stats questions that are beyond my own personal stats powers). As well, we have collaborated on, and published, ground-breaking research about the Count. Or sometimes I just ask him to explain the difference between countable and uncountable infinities over instant messenger. Either way, he’s my go-to math and stats expert. And he also has tattoos of no fewer than six Greek letters on various locations on his body. He is paid for his services with my undying admiration and gratitude and with the ever lasting fame that comes from having this page on my blog. Image credit: I totally stole this photo off of Almost Dr. Dan’s Facebook. Completely stolen. 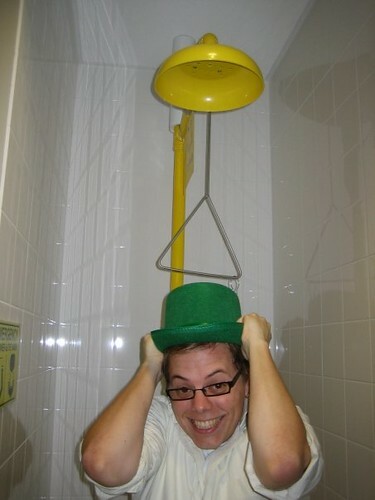 I stole this one in particular because nothing says “statistician” like a man with a St. Paddy’s Day hat standing under a laboratory emergency shower. I love love love the stolen photo. Story behind the photo: a friend was moving away. We decided he needed to have pictures of us to remember what he was leaving. Thankfully, Steph (my office mate) and I have amassed a large collection of hats in our office*. Mix this with sleep deprivation and Voila – we have the makings for a photo montage across campus with us in our many hats. Yup, us statisticians are a crazy breed. I blame the numbers. * these include, but are not limited to elf hats, santa hats, st. patty day hat, giraffe hat, carrot top hat and wizard hat.